Moscow, March 9, Interfax - Seminarian of the Kiev Theological School, kettlebell sport champion Nikolay Tkachuk won a victory at the international Arnold Classic 2017 tournament in Columbus, Ohio, the USA. "I want to thank UOC primate His Beatitude Metropolitan Onufry for giving his blessing to participate in the competition and providing moral and financial support from the UOC primate's foundation," Tkachuk wrote at his page in a social net. 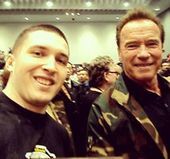 Earlier, Arnold Schwarzenegger who holds the mentioned tournament, invited him to participate in it. Tkachuk has become a kettlebell sport champion more than once. He set a world record in kettlebell swing.